Morooophat was arrested in front of her husband’s house located on Layi Ajayi-Bembe Street, Parkview Estate, Ikoyi, Lagos on Thursday, Punch Newspaper confirms. It was learnt that after interrogation at the EFCC office in Ikoyi, Lagos on Thursday, she was allowed to go home on condition that she would return on Friday (today). The EFCC had also sealed a house belonging to Obanikoro’s two sons, Babajide and Gbolahan, on Banana Island. 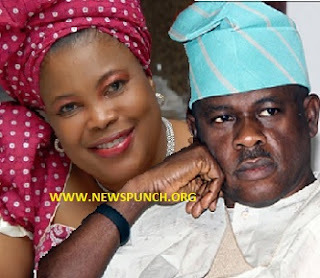 Obanikoro’s wife, who was in the house at the time of the search, alleged that her rights were abused and had even sued the EFCC for N100m. EFCC investigations had revealed that N4.7bn was paid into a bank account of Sylvan McNamara, a company in which Obanikoro’s two sons are said to be directors. About N1.219bn was allegedly flown to Akure on a private plane during the build-up to the 2014 Ekiti State governorship election, which was won by Governor Ayodele Fayose. Fayose was alleged to have received the N1.219bn through his bosom friend, Abiodun Agbele, while the then governorship candidate of the Peoples Democratic Party in Osun State, Senator Iyiola Omisore, allegedly received N1.310bn through company accounts said to belong to him. Omisore had since been arrested by the EFCC and is reported to be cooperating with detectives. Obanikoro, who has been in the United States with his two sons for over 15 months, denied the allegations, insisting that the EFCC was concocting evidence against him and his family. He had also dared the commission to extradite him if it had evidence against him. The EFCC, however, said it was in possession of a CCTV footage which captured Obanikoro and three others loading the billions of naira unto a plane at the Lagos airport in 2014. Meanwhile, Justice Olukayode Adeniyi of the High Court of the Federal Capital Territory in Apo, Abuja, will today hear a N500m suit filed by Abiodun Agbele, an ally of Fayose, seeking an order releasing him from the custody of the EFCC. Agbele was reportedly arrested on June 27 for his role in the handling of over N1.219bn on behalf of Fayose during the Ekiti State governorship election in 2014. The money was said to have been part of the N4.7bn that was siphoned from the imprest account of the ONSA and deposited in the company accounts of Obanikoro’s sons. In the suit filed on his behalf by his lawyers – Mike Ozekhome (SAN) and Olalekan Ojo –Agbele urged the court to declare his arrest and detention as unlawful and award N500m as compensatory damages against the EFCC for his unlawful arrest and detention. Agbele argued, in the fundamental rights enforcement suit, that his arrest and continued detention beyond the 48 hours allowed by the Constitution, amounted to a violation of his rights to freedom of liberty, human dignity and the right to acquire and own properties. He said unless and except the court came to his rescue, the EFCC would continue to infringe on his rights to freedom of liberty. At the hearing of the case on Thursday, EFCC’s counsel, Raymond Ezekiel, urged the court to adjourn hearing in the suit till Friday to enable him to file his counter-affidavit to the suit. Ezekiel said the case file was only handed over to him on Wednesday, and as such, needed time to respond to the constitutional issues raised by the applicant in the suit. Ozekhome had opposed an adjournment, arguing that the suit, being a fundamental rights enforcement suit, required prompt hearing. But he later agreed that the respondent’s counsel be allowed time to respond. Justice Adeniyi subsequently fixed Friday for hearing in the suit.